Koen Brams/Dirk Pültau:In the middle of the 1980s, you were responsible for the IJsbreker (Icebreaker) program: 22 broadcasts on the most diverse cultural subjects imaginable – from fashion and tattooing to literary magazines, cultural centres and culture management. 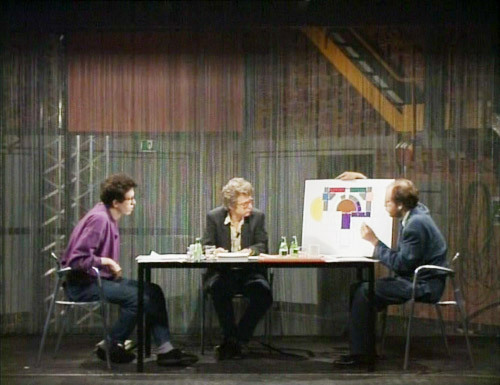 At the end of the 1980s, you initiated Container: ten broadcasts in which Lieven De Cauter and Bart Verschaffel "chatted about civilization". You were given a significant amount of broadcasting time during the 1980s. Jef Cornelis: That is true, and there is an explanation for that. In the early 1980s, Hilda Verboven was appointed production manager of the art affairs department of the BRT, Belgian Radio and Television. She was very enthusiastic about several of my films, which she had seen at the time, including Ge kent de weg en de taal (You know the way and the language, 1976) and Rijksweg nr. 1 (Highway No.1, 1978). K.B./D.P. : Hilda Verboven has confided in us that the two of you were already discussing things before she took on her position as head of the department. You apparently wanted to assess what the possibilities would be when she took over. J.C.: Yes, everything immediately clicked with Hilda Verboven. I remember that I went with her to see Charles Vandenhove. When we returned from Liege, the decision had already been made to do a film on his architectural work. That was Het raadsel van de sfinks (The mystery of the sphinx), which was broadcast in 1983. K.B./D.P. :That was the same year that IJsbreker was broadcast. J.C.: Yes, the art affairs department was looking for a new format for a cultural program. I proposed IJsbreker, a live program in which a variety of people would be able to converse with each other by way of cameras and monitors. Hilda Verboven was a strong supporter of the formula, and once she was behind something, it happened. She gave my work a lot of support – and that was also true for some other colleagues in the art affairs department. The only other department head who was ever that supportive of my work was Herman Verdin. Early in my career, he made it possible for me to complete my films on Alden Biezen (1964), Heverlee Park Abbey (1964) and the Westerlo Castle (1965). Verdin was erudite, a classicist who quickly became fed up with the public network and left to take a professorship at the Catholic University in Louvain. Verboven, on the other hand, was a self-made television producer. She had started out as an assistant director, climbed her way up to production manager of the art affairs department and – after that – head of the department for youth and recreational programming. K.B./D.P. :After IJsbreker, which ran in 1983 and 1984, you did more films for television on fine arts, including the Paris Biennial (1985), Sonsbeek (1986), the 1986 art summer in Ghent, Skulpturprojekte Münster (1987) and another broadcast about art education in Flanders. J.C.: De langste dag (The longest day), the program on Initiatief 86 (Initiative 86) and Chambres d’amis in Ghent, which was over six hours long, can easily be seen as the 23rd episode of IJsbreker. I had access to the technical facilities at the BRT which were normally only used for reporting on the top bicycle races, in order to discuss art in the year 1986, with very different critics and talk show guests at very different locations. K.B./D.P. 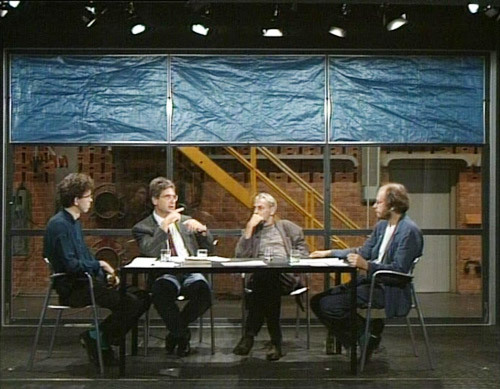 :Container was a talk show, first broadcast in 1989. What led to the making of Container? J.C.: The immediate inducement was a lecture that Bart Verschaffel gave in early 1988, in the Hard op de tong (Hard on the tongue) series, organized by Knack and the Beursschouwburg in Brussels. K.B./D.P. :Did you know Bart Verschaffel personally at the time? J.C.: Yes. Bart is Geert Bekaert’s nephew. I had met Bart back in the 1970s, when I was frequently working with Geert. He hung around a lot in Geert’s house and sometimes offered his opinions on my films. Geert also occasionally spoke about him. K.B./D.P. :Openbaar denken (Public thinking), the lecture that Verschaffel gave at the Beursschouwburg, and which was published first in Knack, then later as part of the essay collection, De Glans der dingen (The gloss of things), is a vehement castigation of Flanders’ attitudes towards intellectuals. J.C.: Yes. I know some of it by heart: "Flanders has virtually no intellectual tradition, and virtually no criticism. We don't even meet the minimum for basic survival. Here, the word ‘intellectual’ is usually used as an insult." I found the lecture very inspiring. K.B./D.P. :One of the groups he took a swipe at were the specialists: "It makes sense, for a moment, to methodically assume that the word ‘specialist’ is a rhetorical qualification used to create protected status." He also had a go at the ‘disseminators of culture’: "This character lives off the space found between foreign countries and our own, between the specialist and the layman, between the educated and the ignorant, and sees it as his task to report and explain everything." About the media, he said, "The newest type of pseudo-openness is performed on the stage of the new media – the talk show. Nothing has to happen during a ceremony, but during a show, in contrast, something has to be happening all the time." J.C.: Bart was often polemic in those days. Earlier in the 1980s, in his lectures at the Institute of Philosophy at the University of Louvain, he contradicted his colleagues and was promptly informed that such things were not done. That was no doubt why there was never a place for him at the Louvain Institute of Philosophy, where he had studied and gotten his doctorate. When I first spoke to Bart about Container, he only had a part-time position. I offered him another part-time job at the BRT, but I really had to convince him to take part. He was not immediately for it. K.B./D.P. :In 1988, you submitted a program proposal to the BRT management, which had a clear echo of Bart Verschaffel’s text: "Within the broadcasting corporation, as is the case in the countries around us, there is a generous supply of talk shows. Everyone comes in and sits around an anchorman. Each of the guests respectively enjoys something of a name in the media and shows up on television either to reinforce that or lose it. Having a name for yourself without putting in TV appearances has become impossible. What is consistently conspicuous here is the lack of ‘public discussion’. During the two-person conversation, some topics are barely touched on, as a kind of sideline, and in order not to undermine the amusement value, people restrict themselves to biographical details. The live audiences are innocents in the old-fashioned role of a theatre audience, a role they cannot live up to. In a certain sense, the television medium works against that ‘openness’. The cultural media world should discover its own ‘openness’. There are precedents, especially among our neighbours to the south, notably in late-night programs with a commercial slant (France I: Permission de minuit, and Italian television’s Those of the Night)." The proposal for the program was for no less than 52 broadcasts of 60 minutes each. J.C.: I felt that Container should be a weekly program, so the speakers would have a chance to loosen up. But the management decided on once a fortnight. But do you know what it was really about for me? J.C.: I wanted to get out of the BRT. J.C.: Get out of there! Try to construct an instrument, a place where – under nobody’s control – I could produce something. I wanted to divorce myself from the public broadcasting network. It may sound dumb, and naïve, but I wanted to make my own working space, my own studio. It was an attempt to survive. I could see the storm coming. I wanted to disappear. K.B./D.P. :Was that the reason for building the Container that gave the program its title? K.B./D.P. :The first program proposal for Container states, "Due to the lack of people and technical facilities, I propose an infrastructure that requires little time or space, but which can still allow a high antenna frequency, hence ‘a Container’ as a starting point, which can be set up according to the availability of studios 1, 3 or 5, or even in the front extension of the building." There was at that point no mention of moving around, away from the BRT building. J.C.: That may be, but it was certainly in the later proposals. The Container was essential for me to gain my independence. It was an attempt to get out from under the control. That was also the reason the program had to be broadcast as late as possible. I wanted the time no one else was interested in, the block after the late news. I wanted the left-over time, the ‘non-time’. K.B./D.P. :Your proposal was emphatically padded with economic arguments. "Instead of having to request its own studio or film time, the mobile studio will attach itself to the extra studio or film time of the other electronically produced programs." J.C.: What I thought was that if it didn't cost a lot of money, it might have a chance at lasting a while. At that time, there was always football on television on Wednesdays. I wanted, for example, to drive to the cities where there was a game and make use of the personnel who were made available for reporting the football games. K.B./D.P. :Container was indeed broadcast on Wednesdays. J.C.: Yes, it was meant to be a parasite that you could hook up anywhere, but that unfortunately didn't work out. J.C.: The trailer that was supposed to carry the Container was not ready when the first Container program was broadcast. The time they had in which the Container had to be constructed was extremely short. At the beginning of February, 1989, there was still no green light to start building the Container, and the first broadcast was planned for April 5, 1989. Stéphane Beel’s designs were ready, and there were already several proposals from contractors, but the management just kept stalling. At a given point, Bert Hermans, general director for television, called me into a meeting of the board of directors. Then the decision was finally made. Els Witte, chairman of the board of directors, signed for it. Then they could start building the Container. K.B./D.P. :In the Flemish Radio and Television (VRT) archives, there is in fact a note from Bert Hermans, addressed to Els Witte. On 13 February, 1989, he wrote, "One of the 1989 program proposals approved by the board of directors on 27 June, 1988, concerned the program, Instuif (Drop in). Because people and technical facilities at the BRT are limited, that ‘dropping in’ will have to take place within a television infrastructure that requires little time or space, and which can still permit a high antenna frequency. Now that the BRT allocation has finally been approved and the government is insisting that the extra financing be made ‘quickly visible’, the realization of this Instuif, among other things, has become very urgent." While Hermans’ argument runs entirely parallel with your own arguments on behalf of the program, there is no mention of Container in his letter, but instead, a program called, Instuif. J.C.: Those have to have been his own words, because the title, Instuif, says nothing to me at all. Instuif: horrible! Bert Hermans was at the end of his career. His successor, Jan Ceuleers, would never have agreed to my project. K.B./D.P. :Bert Hermans asked Els Witte to agree to an offer quoted by Versluys contractors, as they had come up with the lowest estimate. Els Witte signed, and on 14 February, the next day, they started building the Container. J.C.: I will never forget that scene. I was standing in the corridor. Els Witte had signed, there in the corridor! They immediately started construction on the Container. K.B./D.P. :It is strange that both Bert Hermans and you repeatedly defended your proposals with economic arguments – reduction of studio or film time, fewer staff and so on – whereas the Container itself cost a pretty penny: two and a half million francs [approximately 62,600 euro], to be precise. J.C.: It was indeed a contradiction. The expensive Container was also an insurance policy, a guarantee. K.B./D.P. :That the program wouldn't be immediately scrapped? K.B./D.P. :How did you come up with the idea of a Container? J.C.: I first thought of a fish-and-chip van. I had visited a number of specialized companies and had been told that those vehicles were too lightweight for the program that I wanted to make in it. After that, I approached a site hut company. I envisioned a mobile structure that could be opened. The site hut wasn't the answer, either. K.B./D.P. :In the files on Container in the VRT archives, there is an article from the German art journal Kunstforum – an article on art and Containers. It refers, for example, to Portikus in Frankfurt, an exhibition located in a Container, run for years by Kasper König. Did that article influence you? J.C.: I probably read that article, but I have forgotten what was in it or what its impact was. K.B./D.P. :The article was in the November-December, 1988, issue of Kunstforum – in the weeks when you were probably visiting the companies that built fish-and-chip vans and site huts. There are a number of ideas in the article that are worth reading. Hans-Peter Bender, who was being interviewed, said, "Im ersten Weltkrieg wollte die US-Armee ohne zeitraubende Umladevorgänge vom Schiff auf andere Transportmittel ihren Nachschub zu den Kriegsschauplätzen in Europa möglichst rationell organisieren. Dazu war der Container eine geradezu geniale Erfindung, da geschah eine Institutionalisierung der totalen Mobilmachung, militärisch, und später auch wirtschaftlich und gesellschaftlich. Die sofortige Verfügbarkeit über Ressourcen, an Menschen wie an Material, wird durch das Einsparen von Zeit garantiert. Daher ist der Container ein Werkzeug der Macht, und Machtausübung widersetzt sich ja der Veränderung und Befreiung, ihr Wesen ist ja vielmehr das Abgrenzen und Absichern." This argument sounds very much like yours. J.C.: Yes it does. I wanted a structure that could be quickly put into action. K.B./D.P. :After you visited the companies for the vans and site huts, did you get in touch with Stéphane Beel? J.C.: No, I first talked with another architect, John Körmeling. He came to the BRT and we spoke about the project, but we were not on the same wavelength. K.B./D.P. :You would think that he would be interested in a project like that. J.C.: The spark didn't catch. It did with Beel. K.B./D.P. :What ideas did you offer to Stéphane Beel? J.C.: It had to be a construction that could be opened and closed: a working space, including storage and a studio we could broadcast from. The light and sound installation had to be completely built-in. The only thing that was necessary to start broadcasting were outlets for electricity and telephones. K.B./D.P. :The design, and the style – did you have something to say about that? J.C.: It was all decided together with Stéphane Beel. We thought of every detail: the table, the chairs, the chinaware… Even the coffee machine. J.C.: They were Stéphane’s idea. K.B./D.P. :What meaning did the cowhides have for you? J.C.: I associate them with war. The price of leather goes up in wartime, when a lot of leather is needed for boots. K.B./D.P. :Did the cowhides also have something to do with isolation, given your utopia of a working space of your own? J.C.: You might interpret the cowhides that way. K.B./D.P. :How did you locate Stéphane Beel? J.C.: I knew the Flemish architectural world. I no longer remember if I had spoken with Geert Bekaert about it. J.C.: Definitely not. He had nothing to do with building the Container. Do you know when Bart Verschaffel first saw the Container? It was when he was driven in at the BRT. He was driven in and he fell right through the wheel carriage - the wheel carriage it was mounted on collapsed! K.B./D.P. :Had Versluys, the contractor, made a mistake? J.C.: It was dramatic. The Container wheels collapsed. Unbelievable. I had insisted that the Container could be driven, but that kind of wheel could not carry the five tons of weight. After that, the bottom of the Container was completely re-welded. K.B./D.P. :Were there other defects when the Container was delivered? J.C.: A few minor details, and of course the fact that the trailer that it was supposed to be mounted on was not finished. Versluys couldn't build the trailer themselves. They weren’t allowed to, anyway. I was very happy with Versluys, with the exception of that incident with the wheels. And in addition to the Versluys team, I was able to rely on the BRT technicians. The managers from the technology department made a number of people available to work with Versluys in order to get the Container finished on time. With a private company! K.B./D.P. :So the technology department management supported you. How did that come about? J.C.: I had immediately contacted the management of the technology department when I knew I wanted to build a Container. Everybody in the department was behind me. They supported me because I had built up a certain reputation, among other things with IJsbreker, but certainly with De langste dag (The longest day). I think they liked the challenge, and they knew that I put everything I had into it. Building the Container went beyond all the limits. The general director of television even invested a part of his own budget. For some people that certainly was annoying. K.B./D.P. :Were you satisfied with the final result? J.C.: Versluys built a Rolls-Royce. It was an architectural and technical tour de force. The Container was, by the way, exhibited in Flanders Technology, the technology trade fair set up by Flemish Prime Minister Gaston Geens. J.C.: There was never a pilot broadcast! K.B./D.P. :Nonetheless, one was prepared. That is evident in a lot of correspondence from the people involved: studio personnel, speakers, cameramen, and so on. J.C.: Nobody ever made a pilot broadcast. J.C.: There was simply no time. During the extremely short time in which the Container had to be built – barely six weeks – I hardly slept. By the end of it, I was impossible to live with. I was extremely tense. I blew up at all kinds of people. But I also saw no point in a pilot broadcast. I felt that you just had to go into the Container, sit down and start talking. I did not want any rehearsing. The speakers would meet each other once beforehand and look at each other's visual material. If the discussion then threatened to get going, someone was there to say, ‘Put the cork on the bottle’, which was the signal not to go deeper into the issue. K.B./D.P. :Every Container broadcast began and ended with the same piece of music. Did you choose the melody? J.C.: Yes, Laura by Charlie Parker. K.B./D.P. :Why did you choose that piece? J.C.: Container was a late-night program. The music formed a kind of transition. I love Charlie Parker's music. K.B./D.P. :The first broadcast was about sentimentality, and the three speakers were Bart Verschaffel, Lieven De Cauter and Patricia De Martelaere. 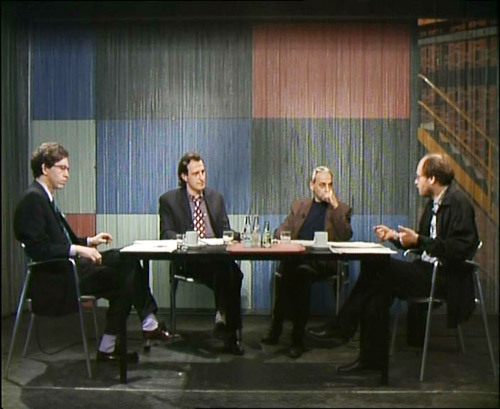 Verschaffel and De Cauter reappear in each broadcast as permanent panel members, and they also take the same seats in the Container, with Lieven at the left and Bart at the right. How were Bart and Lieven selected for the program? J.C.: In any case, there was no one at the BRT I wanted to work with. Bart Verschaffel had opened my eyes with his lecture at the Beursschouwburg: "Thoughts are not slaves whom people can order around and use to satisfy neighbours, masters, unfortunates, good causes or socio-political groups." For me, it was evident that he was personally involved with Container. He did it on condition that Lieven would be the second permanent speaker. He wanted somebody he knew well and could trust. I totally understood that. They were both given a part-time contract with the network. K.B./D.P. :You had already worked with Lieven De Cauter and Bart Verschaffel, on your film on art education in Flanders. J.C.: Yes, and after Container, I would also complete various films with Bart Verschaffel, one on Jan Fabre, in 1990, The music box in 1994, two on René Magritte in 1995 and 1997, and one on Thierry De Cordier in 1996. K.B./D.P. :At the time – it is not quite clear exactly when, but it was probably at the end of 1987 - De Cauter and Verschaffel had set up the association WITT, together with Rudi Laermans and Paul De Vylder. Both Rudi Laermans and Paul De Vylder put in an appearance in Container. What was the relationship between Container and WITT? J.C.: As far as I was concerned, they had nothing to do with each other. K.B./D.P. :We have spoken with the four members of WITT. All of them confirmed that they had considerable correspondence with each other about the subjects that would be discussed in Container. J.C.: With each other, that's possible. K.B./D.P. :In the VRT archives, we found a letter from Lieven De Cauter, "addressed to the members of WITT and J.C.". As a title for the program, he suggested, ‘De fabelen der beschaving’ (The fables of civilization), or ‘De fabelachtige beschaving’ (Civilization as fable). Beel also mentions those titles when he submitted his plans for the mobile studio. J.C.: I wanted to stick to the title, Container. ‘Containing’ is what it was about for me. Another title wouldn't work for me. K.B./D.P. :In that letter from early December, back in 1988, De Cauter described the program as "a kind of fitted-out working meeting for a project", and he gave an example: "Ovid in cartoon form – a metamorphosis. A young cartoon artist comes up with the idea of making a comic strip of Ovid. At a working meeting with WITT, several unknown metamorphoses are read aloud and selected." He also summed up a number of topics for discussion and had comments ready for everybody involved. To you, he wrote, "Jef, please don't waste all your credits on that Container." J.C.: The Container was my idea. It was an object. Isn't that obvious? I needed that object. Filling it all in was secondary. K.B./D.P. :And WITT went along with that? J.C.: I never discussed it with WITT. 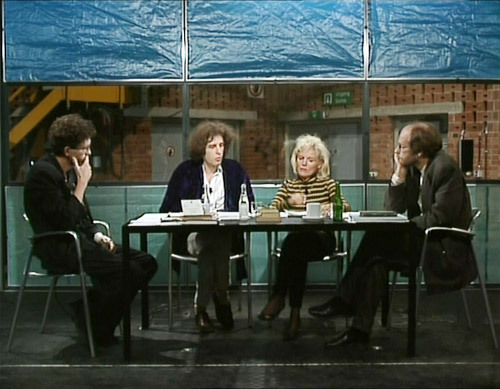 The first broadcast, incidentally, had Patricia De Martelaere as the only guest, and I think she also proposed the theme – sentimentality – or at least had something to do with it. K.B./D.P. :A press conference was held the day before the first broadcast of Container. How did that go? J.C.: There were a lot of people. On the same day, Lieven De Cauter was a guest in Argus, the public network’s media program. K.B./D.P. :Two days later, the Flemish newspaper Het Laatste Nieuws criticized the Argus broadcast: "The segment on Container was particularly aggravating. It was conspicuous navel-staring, which completely bypassed the purpose of promoting a new BRT program. The presenter of Container made comments that would certainly be offensive to the BRT cameramen (‘technical problems are not my affair’), and more than anything else, was just pretentious. Anyone who had watched Argus will certainly not have watched last night’s Container, and rightly so. Zak did a brilliant cartoon of it, with the caption, ‘Next subject’." Container was not even off the ground, and the storm clouds were already gathering. Had you discussed a media strategy in advance with Verschaffel and De Cauter? K.B./D.P. :The beginning of the first Container broadcast was legendary. It was on 5 April, a Wednesday, at 10:45 in the evening. As soon as the strains of Charlie Parker's Laura faded away, Lieven De Cauter said, "Let's start with something very simple, something really simple, something straight from life, as it were, namely, The sentiments’ track (Het ontroerparcours). Not so long ago, several well-known Flemish personalities were interviewed in the weekly television magazine Humo, and you [Patricia De Martelaere] have, as it were, built on those texts with the interviewers, with the question, ‘What was moving about it – What touched you?’ And you pointed out some of the highlights. That gives us solid ground to start out on, and we can see where we end up." The viewers did not know Lieven De Cauter. He was not introduced. He didn’t introduce himself and his name wasn't even shown on screen. That only happened after a full three minutes, after the other speakers, first Patricia De Martelaere, then Bart Verschaffel, have come on screen and have also had something to say. Was it your idea to begin the first broadcast with no introduction, either of the subject or the speakers? J.C.: It had to start out quickly. K.B./D.P. :Along with the fragments from Het ontroerparcours interviews in Humo, quoted by De Martelaere, different series of images were shown and commented on by the speakers. J.C.: It was my opinion that we shouldn't show so many images. I found that beside the point. K.B./D.P. :You just wanted a discussion. K.B./D.P. :In the first broadcast, all sorts of things went wrong with the visuals. Images were requested and never appeared, or only belatedly came on screen. J.C.: We had agreed about how the images should be requested, but it often went wrong. It's logical: people who are talking are concentrating on what's being said. Don't forget that Container was a live program. K.B./D.P. :You could not really tell that it was live. It was obviously unedited, but it was not clear that it wasn't filmed ahead of time. J.C.: That is a comment I have heard before. K.B./D.P. :Could the speakers see those images inside the Container? J.C.: Bart and Lieven had a monitor, but Patricia didn't. I didn't actually want to work with images, or at least not with so many. I wanted a space where you could have a conversation. K.B./D.P. :What did you think of the first Container broadcast? J.C.: I found the first broadcast a total failure. I hid away in my office and started working out my arguments to defend it. I thought Container would be immediately taken off the air. K.B./D.P. :In your opinion, what went wrong? J.C.: It all started before the cameras even started rolling. Lieven had himself made up. I found that entirely uncalled for. K.B./D.P. :Was Bart Verschaffel also made up? J.C.: Yes, and so was Patricia. Lieven had organized that himself. What I envisioned for Container was exactly the opposite. I wanted nothing more to do with all those conventions. I wanted to break out of television. That was an illusion – I realize that. But in any case, there was no makeup artist around for the second broadcast of Container. K.B./D.P. :You say you were disillusioned after the broadcast. Why? J.C.: They were performing an act. It was all played very formally – it was very academic. K.B./D.P. 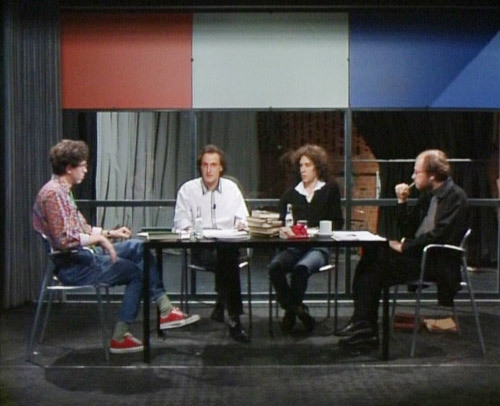 :But you knew that the first broadcast would be a conversation on the subject of sentimentality, with Patricia De Martelaere, Bart Verschaffel and Lieven De Cauter: three academics. What had you expected? J.C.: That, for example, there would be moments of silence. If you have nothing to say, then you don't say anything. It was all played on the safe side. It was too audience-orientated. I feel that you have to be able to make a broadcast in which you can spend a half hour with nothing being said. K.B./D.P. :You felt they filled it up with talk? J.C.: Yes, I felt that nothing happened. Perhaps Bart and Lieven were not the right people in the right place. But I don't blame them. I threw them to the wolves. I was the one who was responsible for the program. K.B./D.P. :There was some friction between Lieven De Cauter and Patricia De Martelaere in that first broadcast. Did that disturb you? J.C.: No, not at all. But nobody pushed through it. They didn't show enough of themselves, didn't give anything away. At least that was what I felt that moment. I have watched that first program again and have concluded that I was mistaken at the time. K.B./D.P. :The ending was not entirely flawless. De Cauter said, "We should be able to come to a decision, find a common ground." Verschaffel answered, "Really? Should we do that?" To which De Cauter replied, "Someone is whispering that in my left ear. There is a voice from above…." Verschaffel interrupted him with, "Just round it up," but De Cauter continued, "…that is telling me I have to round it off. I would say that sentimentality is a phenomenon that takes place in our culture, that continues to work through our culture. You cannot deny that. We are all sentimental…" Verschaffel interrupted him again: "Wind it up!" De Cauter: "…and that is not a dangerous thing, but at a certain moment, it becomes dangerous. It is flushed out of hiding, as it were." Verschaffel then asked himself if that was the decision, to which De Cauter replied, "You can do it better, Bart. You can easily do a better job, I know that, Bart." Bart Verschaffel has the last word in the broadcast, saying, "No, let's stop there." J.C.: I was in continual contact with Bart and Lieven. They both had receivers. After 60 minutes, I told them they had to stop. K.B./D.P. :Did you interfere during the broadcast? J.C.: For example, "Stop it. Nobody can follow what you're saying." K.B./D.P. :Did you tell Bart and Lieven that you didn't think the broadcast was any good? J.C.: Yes, after every broadcast, we watched the program and did an evaluation. It got pretty rough after that first broadcast, but they never abandoned me. And we couldn't go back. We had to continue on the same path. K.B./D.P. :The press was devastating. In the daily paper Gazet van Antwerpen, R.V.H. wrote, "I managed to stick it out for an hour and there won't be many viewers who can say that. Rarely has the BRT succeeded in presenting philosophy and culture in so unappealing a fashion." In the weekly Knack Weekend, Edward Van Heer wrote, "With the postmodernist motto of ‘everything is interesting’, Lieven De Cauter and Bart Verschaffel made an interminable mush of gossiping on a given theme. The gentlemen are academically trained and we are bound to be aware of it." In Humo, Mark Schaevers wrote, "Tragic. That is a big word, but I fear it's already said. It is tragic that a program that emphatically sets out to dispel clichés about intellectuals turns out to be a showpiece for all the overused platitudes applied to that breed. Café chatter is how the program can be summarized, and it would have been better if they had stuck to that." J.C.: The program was shot down right from the first broadcast. I wanted Container to use leftover time, to be invisible, but the opposite was the case. We had all of Flanders down our throats. We were, as it were, all chased into the same corner – Bart, Lieven and me – in order to survive. Certainly that was true in my case. K.B./D.P. :Lieven De Cauter and Bart Verschaffel’s comments before the first broadcast are also worth noting. The daily paper Het Volk quoted them as saying, "We are aiming for the kind of people who never watch television and now have to watch it… We are aiming for an audience that is still awake at 10:45 at night and still in command of their powers of reason… Actually, we are not aiming for an audience." So we will ask you the same question again: Had the three of you agreed on how you would present the program to the press and the public? J.C.: No, but I had no problem with their approach. K.B./D.P. :Another example: in the daily Het Nieuwsblad, H.D.J. commented, "The two initiator-link men had already made a big blunder at the press conference organized by the BRT, by reporting that they shouldn’t say any more, ‘given that the most important information has already appeared in a number of magazines (mentioned by name).’ It’s not exactly an expression of civilization, more a form of insult […]." Do provocations like these wholly or partly explain Container’s antagonistic reception? J.C.: Not in my opinion. The program was a threat to the self-satisfying discourse that they were all producing in their own respective venues. Humo, in the way of Humo, Marc Reynebeau in Knack: they were citadels, and suddenly there were these anonymous characters showing up on television! In my opinion, Bart and Lieven were attacked because people saw them as competition. K.B./D.P. :Container was a format that in any case was hard to sell, but De Cauter and Verschaffel tried to bring it across in a polemic, provocative way. In a further example, De Cauter was quoted in the weekly magazine SiC as saying, "We actually detest television. I rarely watch it. I find it a dumb medium." J.C.: I am sticking to my own explanation. The program was a threat to a number of journalists who themselves harboured their own ambitions where television was concerned. But perhaps you can say that we were not very tactical in the way we approached it. K.B./D.P. :The second Container broadcast was titled Between madness and perfection. 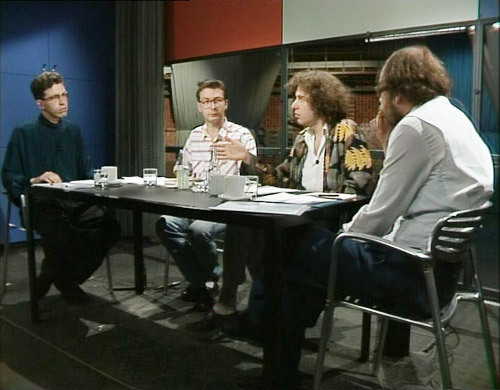 It was about the exhibition, Open mind, which had only just opened at the Museum of Contemporary Art in Ghent, four days before the broadcast. Who proposed the subject? J.C.: I think it was my idea. K.B./D.P. :The first press release about Container had already mentioned that one of the programs would be devoted to Jan Hoet’s exhibition. J.C.: To me, it was self-evident. K.B./D.P. :Again, there was only one guest, the Dutch art historian, Frank Reijnders. J.C.: Yes, that was the last broadcast with only one guest. From then on, we always had four speakers. K.B./D.P. :How were the guests selected? J.C.: Bart and Lieven made suggestions that I almost always followed. I did have a right to veto them. J.C.: Those visuals were done by Jan Blondeel, from the department of art affairs. They also had a floor plan of the museum, so they could always refer to where the work was located. K.B./D.P. :The program was literally a live, public criticism of the exhibition. J.C.: It was a piece of art criticism, on television. K.B./D.P. :Lieven De Cauter and Bart Verschaffel were irritated by the extreme polarization in the exhibition, the contrast between the so-called sterile, academic art and art brut, which was very alive indeed, made by the mentally or emotionally disturbed. Their claim, however, was that at the point when you could make an abstraction of that polarization, you could enjoy the exhibition. What was Jan Hoet’s reaction to the Container program on Open Mind? J.C.: At the time, I no longer had much contact with Jan. K.B./D.P. :It looked as though people had agreed in advance that Jan Hoet’s name would not be mentioned. They repeatedly talked about the Museum of Contemporary Art in Ghent, or just about Ghent or the makers of Open Mind. Who suggested doing it that way? K.B./D.P. :Nonetheless, Jan Hoet took steps to support Container. On 1 July, 1989, an open letter from Jan Hoet was published in De Morgen. He wrote, "Although I was personally not happy with the way Container dealt with our exhibition, Open Mind, I still completely understand the importance of the (potential) confrontation of such initiatives with programs exhibiting the breadth of aspirations apparent in Container." And he went on to say, "The initial criticism of Container had nothing to do with the controversies that always accompany a program of that kind. They seem so obviously drummed up from certain corners in order to cause harm that I feel I have to let my own personal voice be heard. I have faced too many similar mechanisms in the past not to recognize them." The Gazet van Antwerpen also did a report on the Flemish "art pope", Jan Hoet, "also a good friend of Container director, Jef Cornelis…"
J.C.: You're not serious? I had not had much contact with Jan Hoet since De langste dag, about the Ghent summer of art in 1986. K.B./D.P. :The end of the broadcast is very rough. It's not finished off. The speakers are simply drowned out by the sound tape from Jan Blondeel’s footage, which the program also started with. Was the ending determined beforehand? J.C.: In the case of that Container broadcast, it was decided ahead of time. We were testing out various possibilities. K.B./D.P. :Was that broadcast also evaluated? K.B./D.P. :Was the guest speaker, Frank Reijnders, also involved with that? J.C.: No, just the three of us looked at the tape. During the same meeting, we also discussed the subject for the next broadcast. I did it the same way when I was working on IJsbreker. K.B./D.P. :The press continued to be acidic. 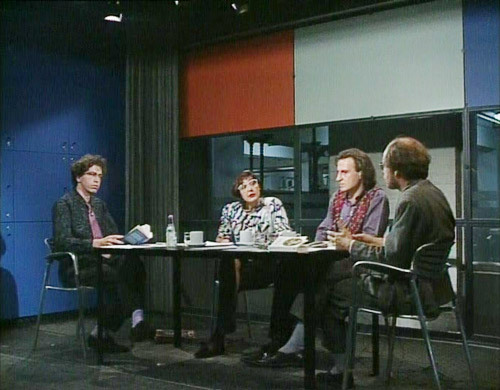 On 26 April, 1989, Marc Reynebeau got mixed up in the discussion in an article entitled, ‘Plattelandsjongens’ (Country boys), saying, "The way conversation in cafés fades into the general din, Container died last week under the banging and hammering of idle slogans, as if Verschaffel and De Cauter had given up." And Rudy Vandendaele in Humo: "What you got to see were the oversized egos of Lieven De Cauter and Bart Verschaffel. They were forever jumping for the chance to lay the golden egg, proving themselves right, and Frank Reijnders, who would have been best able to contribute some knowledge of the issues, was quietly suffocated to death." J.C.: The stuff we had dumped on us was unbelievable. K.B./D.P. :The third program initially started out the same way as the first two programs. With no introduction, Bart Verschaffel began reading a letter by Arthur Schopenhauer. Then Lieven De Cauter came on screen and said, "Good evening, welcome to Container. Tonight we will be talking about the Puntzak van Heinrich Heine (Heinrich Heine’s Paper Cone). The Puntzak was a kind of letter project presented in Amsterdam by the four gentlemen you see here, as part of a series on theatre and politics, and that project…" Then he stopped short and said, with obvious distaste, "But perhaps I should first introduce them, because I have just been requested to. Directly across from me is Mr. Bart Verschaffel, philosopher. Next to Bart is Mr. Paul De Vylder, art historian and artist, and next to Paul is Mr. Rudi Laermans, cultural sociologist. I am of course Lieven De Cauter, philosopher and art historian, at your service. Now, back to that Puntzak. It was a correspondence project, and it was one of those letters that you just heard. The letters were read aloud, in a series. Several questions that came up as we were preparing that project have remained open, so we would like to address those issues tonight. The first question was: How do those intellectuals, writers, artists, and philosophers relate to history that comes to the surface in the revolt, in the outbreak of revolution?" There was suddenly an introduction. Why? J.C.: We were under pressure to apply the formula. I don't have any other explanation. K.B./D.P. :It is interesting, though, that the open ending was kept. From that, one could conclude that the open beginning is not possible, but the open ending apparently is. K.B./D.P. :The Puntzak van Heine (Heinrich Heine’s Paper Cone) was a repeat of an activity organized by WITT in Amsterdam. Before that broadcast, Lieven De Cauter wrote a letter to you, in which he said, "You didn't see much in the Puntzak van Heine, so I am sending you copies of the letters that were used. A couple of letters from Marx still need to be replaced. There are a few excellent new discoveries. The whole thing will be more focused." He went on to write, "One possible variation that I envision is that a couple of good actors are put into the Container with these texts." He was thinking of Jan Decorte and Josse De Pauw. J.C.: I didn't want that. I wanted to keep the conversational format. K.B./D.P. :That broadcast proved to be the most radical expression of Bart Verschaffel’s ideas on open thinking. In the Puntzak van Heine, it really happens. The confrontation with the series of images – for example, Goya’s prints, together with the Schopenhauer letter – was very successful. In the introduction, Lieven De Cauter had said that they wanted to question the relationship between history and image. It was not only open thinking, but a hermeneutic experiment. J.C.: Paul De Vylder supplied all the images. He also, by the way, provided the series of pictures in the first Container program on sentimentality. I had already been acquainted with Paul before that. He had been involved in the IJsbreker broadcast on the Antwerp art scene. K.B./D.P. :What did you think of the Puntzak? J.C.: I don't think it worked. We were testing out Container, and the test for me was a failure. K.B./D.P. :A test? Did you view the first Container broadcast as trial broadcasts – as pilots? J.C.: You could put it that way. We were trying to make something of our own. I wanted to make a kind of lean-to structure – a location that offered a number of people the chance to do something, but we were never given the time. K.B./D.P. :Had you thought that, at a certain point, you would work with other people in the Container? J.C.: It was an instrument that could have had many faces. J.C.: The intention was that after a while, Bart Verschaffel and Lieven De Cauter would be replaced by other people. It was supposed to become a game of musical chairs. I also wanted to use that same instrument to make other programs. I saw it as a place for everyone, but no one dared take the first step. K.B./D.P. :Why couldn’t you get the musical chairs going? J.C.: After the first broadcast I already knew that Container would be discontinued. I wanted to do at least ten programs. Otherwise, I would really have the feeling that I was finished. We started out with the three of us and we finished with the three of us, but I continued to work with Bart. You will have noticed that. K.B./D.P. :And you also made films with Rudi Laermans and Paul Vandenbroeck. K.B./D.P. :Container 4 also focused on an exhibition. This time, it was Art Deco in Europe: Decorative Tendencies in the Applied Arts around 1925, held at the Centre for the Fine Arts (BOZAR) in Brussels. Oddly enough, the exhibition itself was not discussed. It was about Art Deco in general. J.C.: I suspect that Lieven De Cauter had suggested the subject. It was one of the topics that he was particularly interested in. The broadcast itself didn't convince me at all. K.B./D.P. :The guest selections were strange. In the broadcast on Open Mind, curator Jan Hoet was not invited – his name was hardly even mentioned. For the broadcast on Art Deco, Marc Lambrechts, who curated that exhibition, was invited. And there was also Norbert Poulain, chairman of the Interbellum Foundation. They were experts, specialists. Wasn't that contrary to the Container philosophy? K.B./D.P. :The visual material was not very well handled. There was a lot of name juggling. As a viewer, you quickly lost your footing. J.C.: They didn't request the visuals as they should have. We had agreed on things like that, but they didn't keep to the agreement. It is not easy to deal with visuals when you're involved in a discussion. J.C.: I thought the broadcast was really bad. K.B./D.P. :Did the problem have to do with the fact that there aren't enough dilettantes or non-specialists in Flanders? J.C.: Casting the right speakers was in any case very difficult. K.B./D.P. :You could ask yourself if it's even possible to discuss any random subject with any random person. J.C.: Yes, you could see that people were falling back on what they were already thoroughly familiar with. K.B./D.P. :You have already said that you were surprised by the first broadcast, in the negative sense. Isn't it strange that you start broadcasting when in fact you have no idea at all what the final results will be like? J.C.: It felt very sterile to me, although I now feel that I should retract that. K.B./D.P. :If you were disillusioned, doesn't that imply that you had a different expectation of what would actually take place in the Container? What had you expected? J.C.: Confrontation, something wild, the unanticipated…, without it being controlled, and the opportunity for silences. I find silence is sometimes very interesting. It is not allowed on television. On television, everything has to be kept moving. I wanted to break through something in Flanders, but I did not succeed. We were never able to carry on a conversation in a normal manner. We sometimes succeeded in IJsbreker. K.B./D.P. :Why didn't you prepare the subject matter better? Where the object was concerned, the Container, you were a perfectionist. J.C.: I had done IJsbreker the same way. I didn't anticipate any problems. K.B./D.P. :Without having seen a photograph of the Container and with only the television images at your disposal, it is not easy to imagine exactly what the Container looked like. J.C.: The Container could be opened up at both the front and the back. There were various decor elements: curtains, panels… I tried them all out. K.B./D.P. :Were those variations adapted to the themes of the programs, for example for the Art Deco program? J.C.: No, they were improvisations. It also depended on where the Container was located. K.B./D.P. :The Container does sometimes look as though it is in a different place. Sometimes it was filmed from very far away, like a kind of mouse trap. J.C.: It was everywhere: in the workshop, in a corridor, in Studio 3. Wherever there was a place for it, that's the place they pushed the Container into. K.B./D.P. :After Container 4, Lieven De Cauter and Bart Verschaffel were invited to be guests on Argus, the program hosted by Jan Van Rompaey. J.C.: I insisted that they go. Bart was the most vehement about not wanting to do it, but I argued that Container would be taken off the air if they didn't go. K.B./D.P. :The debate on Argus with Knack reporter Marc Reynebeau and Flip Feyten of the Gazet van Antwerpen, did not go very smoothly. The excerpts they selected to show Container broadcasts were extreme caricatures. There was no way to come out of that program intact. J.C.: The way Bart and Lieven were treated was atrocious. K.B./D.P. :You were given the viewer ratings after each broadcast. There were 47,000 viewers for the first program, 19.5% of the total television viewers. For the fourth broadcast, there were 16,000 viewers, or 10.9%. J.C.: Television has no audience. Sometimes people just stick to something, and if a lot of them are doing it, then you know you’ve landed. You are the Pied Piper of Hamelin. I have never believed in an audience. Where is that audience? If I had had to listen to that, I would never have accomplished anything in my life. K.B./D.P. :The Flemish broadcasting network, the VTM, started in 1989, two months before the first Container program was broadcast. Was that an issue for you? J.C.: It didn't affect me much. But Container was the final sigh. It was in the cards that the public network was finished. K.B./D.P. :Container 4 was the last program in which the discussion was about a concurrent event. Container 5 was about Ernest Claes. The guests were Rudi Laermans and Paul Vandenbroeck. Both Rudi Laermans and Paul Vandenbroeck later returned as guests, Rudi Laermans once more and Paul Vandenbroeck three more times. J.C.: When Paul was there, something usually happened. He had a kind of instinct. I wouldn't say that he saved Container, but he certainly made a good contribution. K.B./D.P. :Did you know Paul Vandenbroeck? J.C.: Yes, I had seen his exhibition in the Royal Museum of Fine Arts in Antwerp in 1987. The title of the exhibition translates as ‘Image of the other, representation of the self: On savages and fools, farmers and beggars’. K.B./D.P. :Did you think it a good exhibition? J.C.: Yes. I thought that, as one of few, it made something actually happen in that museum. K.B./D.P. :In Container 5, the speakers were introduced differently. Rudi Laermans was now presented as a religion sociologist and Lieven De Cauter as an essayist. Was that a kind of game for dealing with the introduction format? J.C.: Yes, the titles were a joke. We had decided that people would not hide behind academic titles. We discussed it all at length. There was also the theme of Public Thinking, Verschaffel’s text. K.B./D.P. :Who suggested the subject, Ernest Claes? J.C.: That was Bart’s choice. K.B./D.P. :What appealed to you about it? J.C.: For me, it was an opportunity to take a poke at all that ‘Flemishness’: the fact was that in other circles, Claes was read differently. I was fascinated, because for me it was a subject that seemed to have been lost for a long time. K.B./D.P. :What subjects did you introduce to Container? J.C.: Open Mind. We've already talked about that. All the other topics were suggested by Bart and Lieven. K.B./D.P. :What did you think of the fifth Container broadcast? J.C.: There were good moments in that program, but by that time, we had already had the full ration thrown at us. Container was condemned to the scrapheap right from the first broadcast. K.B./D.P. :The credits listed different technical personnel for each of the different Container broadcasts. J.C.: I worked with the technicians who had done the late news show. They just came into the studio and 15 minutes later we were on the air. They were the ones who were still there at the end of the evening. K.B./D.P. :Wasn’t it difficult to work with different technicians all the time? J.C.: That was no problem at all. K.B./D.P. :The producer of Container was not mentioned in the credits, but it was Hilda Verboven, wasn't it? J.C.: Yes, and I don't understand why she wasn’t listed. She supported Container, certainly in the beginning. K.B./D.P. :The sixth broadcast was two weeks later: The origins of the department store. Was that Lieven De Cauter’s choice? J.C.: That is very possible, given his research on Walter Benjamin’s work, but Rudi Laermans also contributed. At the time, he was researching the history of the department store. I got a lot out of that program. There was a lot of interesting material in it. K.B./D.P. :Christine Delhaye took part, along with Rudi Laermans. J.C.: Yes. Like Rudi, she was at the sociology department at the Catholic University in Louvain. K.B./D.P. :A few years later, in 1993, you and Rudi Laermans completed the film, Voyage à Paris, as part of the Vertoog & Literatuur (Discourse& Literature) program for Antwerp 93, coordinated by Bart Verschaffel. J.C.: You could easily say that without the Container broadcast on department stores, Voyage à Paris would never have happened. K.B./D.P. 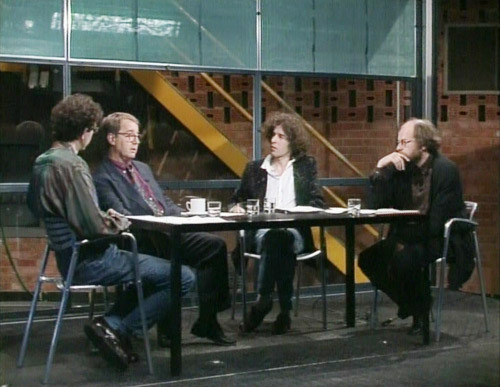 :After that broadcast, on 21 June, 1989, to be precise, you all – Lieven De Cauter, Bart Verschaffel, Hilda Verboven and yourself – had a meeting with Jan Ceuleers, who had just been appointed general director of television. Was that meeting on Ceuleers’ initiative? J.C.: No. I asked Hilda Verboven to organize a meeting with him. K.B./D.P. :What was the meeting about? J.C.: It was about stopping Container. He wanted to cancel the program immediately. K.B./D.P. :There were three more programs broadcast in the fall. J.C.: Yes, I absolutely wanted ten programs. Do you know how I did it? J.C.: In June of 1989, elections were being held for the European Parliament. The BRT held their traditional election show, so I had arranged for a number of the guest politicians, including Stefaan De Clerck, to ask Ceuleers to let them take a closer look at the Container. Some signals work and some don't, but in any case, Ceuleers understood this one. No question that television equals politics. K.B./D.P. :You wanted ten broadcasts, and you got them. J.C.: I also knew that it would be over after those three additional programs. It was obviously my objective to force more out of them, but that just couldn't be done. For Ceuleers, stopping Container was an important way of getting back at his predecessor, Bert Hermans. K.B./D.P. :Bert Hermans had completely supported the program, including the construction of the Container. J.C.: Hermans mostly supported Hilda Verboven. He wasn't especially fond of me. K.B./D.P. :The next broadcast, Container 7, had the same title as a text by Bart Verschaffel, On theatricality. Verschaffel had presented his text earlier that year for the Semiotics and Social Sciences Contact Group of the National Foundation for Scientific Research. J.C.: Bart was indeed the person who took the initiative for that program. K.B./D.P. :The initial idea had been to talk about ‘the man at the window’, a reference to Maurice Gilliams and Henri De Braekeleer. Why was that program never broadcast? You would think that Bart Verschaffel would have a lot of material on that theme. J.C.: Why wasn’t it? I don't know anymore. In any case, we did work on that theme, years later, in The Music Box, a film on Henri De Braekeleer, James Ensor, René Magritte and Jan Vercruysse. K.B./D.P. :Klaas Tindemans and Paul Vandenbroeck were guests in the Theatricality broadcast. J.C.: I knew Klaas from the opera. After De langste dag, I hung around The Royal Opera De Munt for six months, where he was also working. K.B./D.P. :For a project for the BRT? J.C.: Yes. Chambres d’amis and Initiatief 86 had not bypassed Gerard Mortier. He wanted to set up a project on contemporary art in De Munt. It never really got off the ground, although several artists, including James Coleman, Dan Graham, Daniel Buren and others had submitted proposals. K.B./D.P. :In Container 7, excerpts were shown from Landschap van kerken (Landscape of churches), another of your films, which had been broadcast earlier in 1989. J.C.: Yes, with the Carolus Borromeus in Antwerp, the church with the façade that served as a gigantic décor. K.B./D.P. :The fireworks display at St. Peter's Square in Ghent, for the opening of Chambres d’amis and Initiatief 86, was also shown, if in a very pejorative light. It was all about turning things into spectacles. K.B./D.P. :After the first series of seven Container broadcasts, in July, 1989, there was an evaluation meeting, or at least that is what a document from the VRT archives suggests. J.C.: I don't remember it. K.B./D.P. :The document was exceptionally critical: "No one knows that it is live; it is not a real conversation (as it is framed, prepared, timed); the Container is not autonomous and it is not mobile. Therefore, Container is fake, and it does not live up to its own definition." About your own contribution, it says, "JC films Container as if it were architecture. He is looking at a tableau vivant of the Men of Emmaus. He is not in the conversation." J.C.: That, the Men of Emmaus, is rather obvious. K.B./D.P. :About Lieven De Cauter, it says, "He is so preoccupied with playing the role of leader of the discussion that he has little time to formulate things." And Bart Verschaffel "is not thinking about the program, but about what he is determined to get out of it: a safe, even admirable position. Whether it sells or not is irrelevant. Competition between the two?!" J.C.: I know that we met the day after every broadcast. Maybe that document was a summary of an evaluation meeting. K.B./D.P. :It was a legitimate observation that Verschaffel and De Cauter were vying with one another. It was sometimes very painful, at the end of the first program, for example. J.C.: Bart and Lieven had different objectives and methods. You can certainly say that. K.B./D.P. :It was about that time that the first signs of support began showing up in the Flemish press, especially in the daily paper De Morgen. The first was from Mark Verminck on June 21. On July 1, De Morgen published the open letter from Jan Hoet, in which Hoet expressed his respect for Container. On July 28, they printed the reader’s letter from Hendrik Van Geel. On August 14, Pol Hoste made a plea for Container, although not without being critical of Verschaffel and De Cauter: "Maybe it is the competitive character of television that makes their performance so impossible. As if people can only comb their hair in front of a mirror. It makes me sick. (…) Get the Container out of the studios. Let it serve as a mobile office space while the prospecting is going on, and as a mobile studio during the broadcasting. Get it out from under the mental control of Verschaffel and De Cauter." J.C.: I had worked intensely with Pol Hoste when we were doing IJsbreker. It's clear that he would have preferred to see Container develop more the way IJsbreker had. K.B./D.P. :Were those tokens of support orchestrated? J.C.: I wanted to open up a debate about art, television and intellectuality. Obviously, I did everything I could to ensure that other voices were heard. Behind the scenes, I always made sure there was enough going on. K.B./D.P. :The press never seemed to ask you for any explanations. J.C.: I had learned my lesson at the end of the 1960s, specifically in Humo, in response to the television trilogy, Waarover men niet spreekt (That of which one does not speak). I had learned that you have to keep your mouth shut in a country where there is no opportunity for debate. K.B./D.P. :At the end of the summer, the Container moved to TV 2, the public broadcasting network’s second station. Container 8 was about the character of Don Juan. The guests were Paul Vandenbroeck and Monique Hageman, a psychoanalyst. J.C.: I was very pleased with that program. Paul Vandenbroeck and Bart Verschaffel were at their best. K.B./D.P. :All the speakers were in their stride. Each time somebody said something, you could see the shift in perspective on the subject. J.C.: If you compare the eighth broadcast with the first, you can see how they had grown. K.B./D.P. 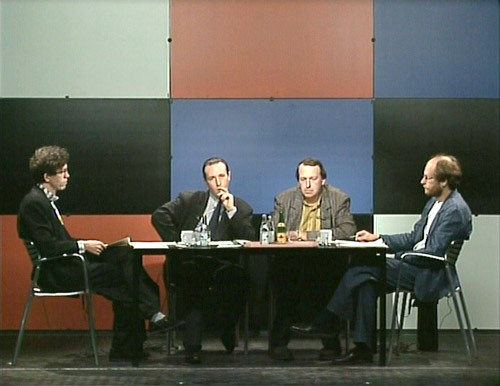 :That was perhaps the best broadcast, better in every way than Container 9, on ‘intoxication’, with Paul De Vylder and Peter Aerts, and Container 10, on ‘exoticism’, with Paul Vandenbroeck and Eddy Stols. J.C.: It was a live program. You never knew ahead of time how the speakers would handle the theme or each other. K.B./D.P. :On August 29, just before the eighth Container program, the public broadcasting network held a remarkable event, the Container Day. Whose initiative was that? J.C.: Mine. Bart and Lieven would not have done that. K.B./D.P. :What was the purpose of the Container Day? J.C.: I wanted to bring a number of people together in order to put pressure on the management to continue broadcasting Container. I asked Georges Adé to chair the meeting. K.B./D.P. :You had already known back in June that Container would be discontinued. Why did you still organize that day? J.C.: I wanted to see if something might be possible. When does someone give up? You have to keep trying. K.B./D.P. :The people invited included all of the Container guest speakers, as well as several important personalities, including Jozef Deleu, Frank Hellemans, Marijke Libert, Marc Reynebeau, Mark Schaevers and Johan Thielemans. Did they know that Container was going to be stopped after the tenth program? J.C.: No, if I had told them that, no one would have shown up. I was still hoping to force the issue. K.B./D.P. :After the fact, Georges Adé was also supportive, in a report that he sent to Jan Ceuleers, general director of television, and Cas Goossens, general manager of the BRT. He had found an original formula. He had asked each participant to, "write down what you remember having said, and then, what the others said". The collection of responses is absolutely worth reading. Bert Beyens, for example, wrote, "Container: these young dudes come into your living room, unwanted, uninvited and un-introduced. Briefly, what television does, all that ‘leading you around’, suddenly stops happening, and suddenly there we are in the midst of all these problems. Why does it happen? Because this is a real change in direction. The potential of television to be a panoptic (controlling) eye is only felt when the viewer is NOT being talked to and looked at." Marc Holthof also had some interesting thoughts. J.C.: Marc Holthof wrote an important text on Container in Andere Sinema. K.B./D.P. :The collection of responses from the guest speakers found its way to Ceuleers and Goossens. Ceuleers answered Adé on September 5, 1989. "I will wait and see what happens in the next three broadcasts. Then no one can claim the program was never given a reasonable chance." J.C.: He didn't wait that long. Less than ten days later, after the program on Don Juan, he informed Hilda Verboven that there would be no more after the ten broadcasts were finished. K.B./D.P. :At about the same time, there was also a written skirmish between Marc Reynebeau and Georges Adé. Adé had ended his own report as follows: "Let us not forget that for a significant portion of the population of Flanders, the faces of ‘real intellectuals’ are those of Gerard Bodifée, Marc Reynebeau and Herman Van Rompuy (the in-house intellectuals, the ‘token negroes’), and that for those same people, the weekly magazine, Humoradio, is a subversive publication." Reynebeau’s response was irritated: "It would be a sign of a minimum of intellectual sensibility if, for a change, you were to begin with an argument, instead of displaying yourself in this light." J.C.: The only thing I can say about that is that, not so long ago, I saw Mr. Reynebeau on television, sharing a bath with a bunch of young ladies. K.B./D.P. :The events that followed Ceuleers’ decision were remarkable. On the day that Ceuleers announced his decision, on September 14, 1989, a letter in your handwriting was sent from the public broadcasting network to Geert Versluys, the contractor who had built the Container. The letter included a long list of things that needed to be done to the Container and the trailer. J.C.: It was in the contract that it had to be finished. K.B./D.P. :Was that just about the contract? You sent the letter on the day that Ceuleers definitively quashed the program. You asked Versluys to finish the Container, down to the minutest details, on precisely that day. J.C.: Versluys had not yet been fully paid. That payment could only take place when the Container was finished. K.B./D.P. :Jef, the contractor, Versluys, sent a bill for a number of additional expenses, no doubt because they had not been included in the original list. So this must have been about optimalizing, rather than finishing the initial job. J.C.: I had the Container finished because it had to be finished. K.B./D.P. :Or because you wanted it that way? J.C.: Perhaps. The first time that the Container was shown as a completed object was in De Singel, for Stéphane Beel’s first retrospective exhibition. K.B./D.P. :That exhibition opened on October 13, eight days after the last Container broadcast, on exoticism. The mobile studio – the Container mounted on the trailer – was therefore still not finished when the last program was broadcast. K.B./D.P. :At the time, you truly did everything in your power to see that the Container was finished and to save the program. The program itself died a noble death. In Container 10, after Bart Verschaffel said, "Gentlemen, it is time!" A text is shown onscreen, a quote from Blaise Pascal: "The whole of our dignity depends on thought. It is on thought that we must depend, and not on space or time, which we are in any case unable to fill. Let us attempt to think well: herein lie the foundations of morality." J.C.: That quote from Pascal was Bart’s suggestion. K.B./D.P. :What other subjects would you have liked to discuss in Container? J.C.: There were dozens of lists with potential topics, from Blaise Pascal to cartography, from Marcel Broodthaers to uprootedness. K.B./D.P. :Some of the themes that you mention show up later in Vertoog & Literatuur (Exposé & Literature), the project that Bart Verschaffel put together for Antwerp 93. J.C.: Yes, and he asked me to do a film about Antwerp. I wanted to set up a project about Paris. I asked Rudi Laermans to write a script. The result was Voyage à Paris. K.B./D.P. :So the Vertoog & Literatuur project was partly founded on Container? K.B./D.P. :Vertoog & Literatuur was also hotly contested. J.C.: And just like Container, the Cahiers – the six books that were produced for Antwerp 93 - were cut up. In less than five years’ time, Bart Verschaffel was entangled in the two biggest cultural storms that ever hit Flanders. K.B./D.P. :What happened to the mobile studio after all that? J.C.: The BRT used it a few more times, but they couldn't really get the hang of it. The trailer and the Container were sold, to someone from Oostende, for a song. By way of a few detours, it finally ended up with a private collector, who set it up in his garden. K.B./D.P. :What did you do after Container? J.C.: What do you think? I was persona non grata at the public network. Fortunately, help came from an unexpected angle. Annie Declerck asked me to do several pieces for her culture program, Verwant. I suggested a presentation on Lili Dujourie’s video works. I also did an interview with Jan Vercruysse. The most important project after Container was the film, Ladies and Gentlemen, Jan Fabre, which I completed in 1990 with Annie Declerck and Bart Verschaffel. For my part, I wouldn't immediately have thought of making a film on Fabre – not that I have anything against his work – but for Bart and myself, the request from Annie Declerck came at just the right time. K.B./D.P. :Lieven and Bart later wrote a column for Knack in the correspondence section. Each of them also wrote articles about their experiences in Container. In Knack, they wrote, "Container disappeared without a peep, after a petite histoire that said more about the intellectual poverty in Flanders than some kind of party game." That last was a reference to a questionnaire by the progressive leftist magazine, De nieuwe maand (The new month), launched in June of 1989. The magazine wanted to discover "today’s five most prominent intellectuals in Flanders". J.C.: Pol Hoste had already told me about that. It was an initiative by Brigitte Raskin and Mark Schaevers, both of whom were editors at De nieuwe maand. Schaevers was also an editor for Humo. K.B./D.P. :In retrospect, 1989 could perhaps be seen as a very important year. It was the start of commercial television in Flanders and the definitive metamorphosis of socialism into populism. How could a magazine like De nieuwe maand come up with the idea of asking 500 intellectuals to elect the five top intellectuals of Flanders? J.C.: Add to that the fact that the sleaziest criticism of Container had to have been published in De nieuwe maand. Johan De Vos wrote the program off by referring to Bart and Lieven’s physical characteristics. It was disgusting. K.B./D.P. :Even now, Container is still frequently cited as the lowest point in 50 years of television. J.C.: That is the best proof that Container had an impact, albeit a different one than I had envisioned or wanted.